Three publicly traded carriers reported results on Oct. 19 with two reporting profits better than 2016 and one with a decline in the third quarter. Werner Enterprises announced profits grew 19% and Covenant Transportation Group’s jumped 61%, but Marten Transport profits fell 7.4% year-over-year. Werner’s profits were $22.5 million during the three-month period ending Sept. 30, or 31 cents per share, a penny below the Bloomberg News consensus earnings forecast. One year ago, the numbers were $18.9 million or 26 cents. Revenue rose 3.9% to $528.6 million. Covenant generated $4.6 million in profits, a quarter per share, easily leaping over the 17-cent Bloomberg News projection. Last year, the numbers were $2.9 million or 16 cents. Revenue grew 8.6% to $178.6 million. Marten earned $7.9 million, or 14 cents, also a penny short of the Wall Street forecast. For the same period a year ago Mondovi, Wis.-based Marten reported net income of $8.4 million, or 15 cents one year ago. Revenue rose slightly in the quarter to $170.7 million from $170.5 million a year ago. • Werner, which ranks No. 16 on the Transport Topics Top 100 list of the largest for-hire carriers in North America, surpassed its 2016 performance in the quarter due in large part to the truckload division and not the logistics arm. In the Truckload Transportation Services division, revenue grew 6% to $407.6 million and operating income surged 71% to $34 million. However, Werner Global Logistics revenue dropped 4.5% to $104.6 million and operating income plunged 73% to $1.3 million. The Omaha, Neb.-based carrier was also aided by a $1 million gain in operating income from its driver training schools, transportation-related activities such as third-party equipment maintenance and equipment leasing and other businesses, whereas the same services lost $1.2 million one year ago. Werner’s explanation is consistent with discussions Transport Topics has had with truckload executives and industry analysts. Both have noted that spot-market prices skyrocketed due to the hurricanes and persuaded drivers to move their trucks into the relief efforts to chase high-price freight, causing a domino effect on the capacity in other markets. Shippers, nervous about the fewer trucks available, contact their carriers and offer to pay above contract prices to maintain the tender acceptance rate, executives and analysts note. Average revenues per tractor per week increased 2.9% year-over-year to $3,693 due to a 3.4% increase in average revenues per total mile and a 0.5% decrease in average miles per truck, the company announced. The average length of haul and the percentage of deadhead miles were relatively flat compared with last year at this time. “Freight metrics have improved, and we have increasing confidence that contractual rates will strengthen over the next few quarters, particularly noting the improving freight market conditions and the expected tightening of supply when the electronic hours of service mandate for the trucking industry becomes effective on December 18, 2017,” the company wrote. At Werner Global Logistics, margins compressed 183 basis points to 14.4% in the third quarter. Operating income, as a percentage of revenue, dropped 321 basis points to 1.3%. Similar to other freight brokers, the better truckload environment hurt the brokerage division because purchased transportation costs increase, too. “Werner Logistics achieved solid revenue growth year-over-year in our truck brokerage solution, while our intermodal and international solutions had lower revenues due to more challenging market conditions,” the company stated. • Marten, which ranks No. 46 on the for-hire TT100, operates four major business segments — truckload, dedicated, intermodal and brokerage. Total operating income for the segments was down more than 12% to $13 million. In truckload operating income fell 11.4% to $5.8 million a year ago. Revenues came in at $92.0 million, down $3.2 million, or 3.3%. Average revenue per tractor rose about $44 year-over-year to $3,484. In the dedicated segment, revenue rose 3.7% to $42.1 million, but operating income declined 18% to $4.5 million. Average revenue per tractor per week fell $30 to $3,441. In Marten’s intermodal operating unit, revenue increased 8.4% to $19.9 million, but operating income fell 3.5% to $1.6 million. In the brokerage division, revenue rose 2.2% to $16.6 million, but operating income dropped 4.5% to $1.2 million. • Covenant — No. 47 on the TT100 — easily had the best day of all the truckload carriers Oct. 19. Average revenue per tractor per week rose 4.1% to $3,922 and revenue per total mile grew 4.4% or 7 cents per mile. On average, about 4.9% of Covenant’s trucks lacked drivers in the third quarter, better than the 6.4% one year ago. “Overall, freight demand was strong and trucking capacity was tight during the third quarter. The market improved each month and has continued at a strong level in October. Equipment utilization measured by miles per tractor improved in July and August. However, significant disruption of freight activity from the two hurricanes depressed September utilization,” Chairman and CEO David Parker said. The strong revenue growth was more than enough to offset the 5.2-cent-per-mile increase in expenses related to salaries and wages, or in this case, raises in driver pay and a 2.6-cent-per-mile rise in maintenance expenses related mostly to the decision last year to keep their trucks longer than in the past. Parker also noted that while subsidiary Southern Refrigerated Transport lost money again in the third quarter, it was a significantly less in the red than one year ago, although the company didn’t break down the financial results division by division. 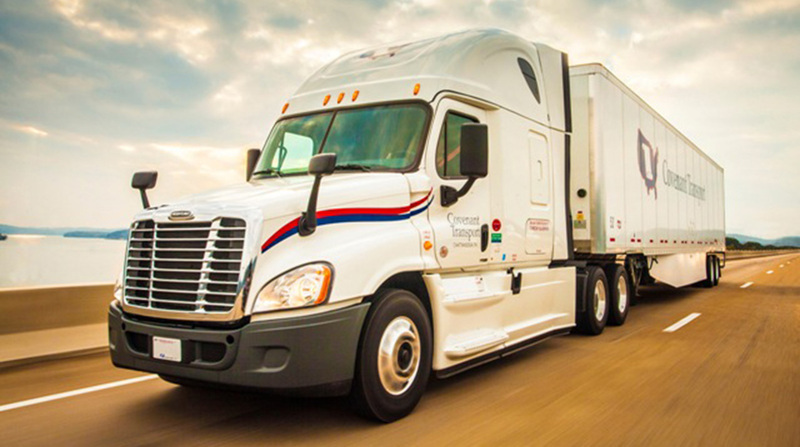 Business also improved in Covenant’s smaller freight brokerage division as revenue grew 61% to $25.6 million in the quarter, of which the CEO assigned $3.4 million to spot business from the hurricanes in Texas and Florida.